I won't give anything away, in this post about Fitzgerald's "The Last Tycoon." 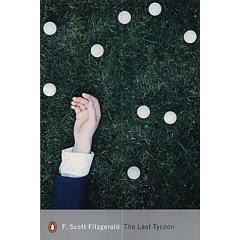 For those of you who don't already know, Fitzgerald passed away before completing this novel... and from everything that I could tell, it would have been a masterpiece. It was so good in fact, that I believe it would have eclipsed "The Great Gatsby." Despite being a rough draft, every word was meticulously chosen and all had an underlying purpose. While I don't believe Fitzgerald had the ability to paint a picture as beautiful as Hemingway, he was still able to use words in such a way that you would feel breathless. I don't know how anyone reads novels anymore. Fitzgerald, in my opinion, was one of the last great authors. That being said, the novel is about a man who essentially runs all the ins and outs of the Hollywood film industry. He has a hand in all major and minor problems, and the novel is an accurate portrayal of the future of not only the motion picture business, but of the world itself. I strongly suggest those of you with a passion for literature to read this novel... it will show you how far off track a lot of authors have gone, in present day. Also interesting is Fitzgerald's notes, which give you insight into where the story was headed... and how the author prepared for writing his novels. "We didn't get the full shock like at Long Beach, where the upper sotries of shops were spewed into the streets and small hotels drifted out to sea - but for a full minute our bowels were one with the bowels of the earth - like some nightmare attempt to attach our navel cords again and jerk us back to the womb of creation." "He spoke and waved back as the people streamed by in the darkness, looking, I suppose, a little like the Emperor and the Old Guard. There is no world so but it has its heroes, and Stahr was the hero. Most of these men had been here a long time - through the beginnings and the great upset, when sound came, and the three years of depression, he had seen that no harm came to them. The old loyalties were trembling now, there were clay feet everywhere; but still he was their man, the last of the princes. And their greating was a sort of low cheer as they went by." "Whatever she does, it is in place of sleeping with Ken Willard. If she walks down the street she is walking to sleep with Ken Willard, if she eats her food it is to give her strength to sleep with Ken Willard. But at no time do you give the impression that she would ever consider sleeping with Ken Willard unless they were properly sanctified. I'm ashamed of having to tell you these kindergarten facts, but they have somehow leaked out of the story." "I noticed the girl long before Stahr arrived at the dance. Not a pretty girl, for there are none of those in Los Angelas - one girl can be pretty, but a dozen are only a chorus. Nor yet a professional beauty - they do all the breathing for everyone, and finally even the men have to go outside for air. Just a girl, with the skin of one of Raphael's corner angels and a style that made you look back twice to see if it were something she had on." "They were smiling at each other as if this was the beginning of the world." "They started back along the shore with the sun behind them. The house seemed kindlier when they left it, as if warmed by their visit." "In love with Minna and death together - with the world in which she looked so alone that he wanted to go with her there." "What people are ashamed of usually makes a good story." "Fatigue was a drug as well as a poison, and Stahr apparently derived some rare almost physical pleasure from working lightheaded with weariness." "People fall in and out of love all the time, don't they?" "Every three years or so, Fanny Brice says. I just read it in the paper." "I wonder how they manage it," he said. "I kknow it's true because I see them. But they looked so convinced every time. And then suddenly they don't look convinced. But they get convinced all over." Seriously, though, this book didn't do it for me. If it had been finished, I'm quite sure it wouldn't have been any better. I think it's Fitzgerald, mostly. I didn't like The Great Gatsby at all, though there were a few lovely sentences in the beginning. I honestly think you were at the wrong house. We were outside for more than an hour, I checked every couple of minutes, and my girlfriend left soon after it started. Next time, call me from a shop close by at the very worst and I'll come down. If you keep me full of wine and cupcakes you have a deal! Jen made brownies again last night. I swear to God I have the best girlfriend in the world. I wouldn't have minded coming away with a different opinion at all. And I most certainly did have the right house! We probably just missed each other. Seriously, after standing outside for half an hour you do begin to feel like a bit of a twit, and after daydreaming for same half an hour, you get to the point where if someone did turn up or door was answered, you are no longer in the right head space. But I am sorry, cause I really did want to be there for this, and I'm also sorry you waited for me for so long. Am I forgiven? Ooh yeah, next to the bath tub! No, it's a bath tub. On the front lawn. Full of hideous bright pink flowers. But it's not bad, and it's a good way to recycle baths! I'm intrigued. Let's definitely meet at your place before your bath water freezes.